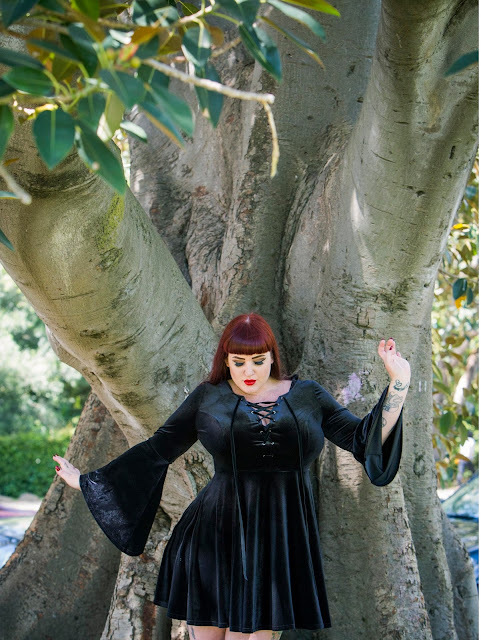 The season Spin Doctor have won my heart once again with their gothic style mini dresses and continue to feed my addiction of giant bell sleeves. I honestly don't know how I lasted as long as I did without adding this 70's style sleeve to my wardrobe. Just look at that sleeve! It's such a flattering style for a girl like myself who likes to cover up and not show too much arm as it elongates and slims. While this is listed as a mini I find the length perfect as it hits mid thigh and does not show too much. After shooting and reviewing the Griselda Mini Dress﻿ I fell in love with the fit of this little number. The flowing fabric is perfect for an Aussie summer whole still keeping to that whimsical gothic retro feel. 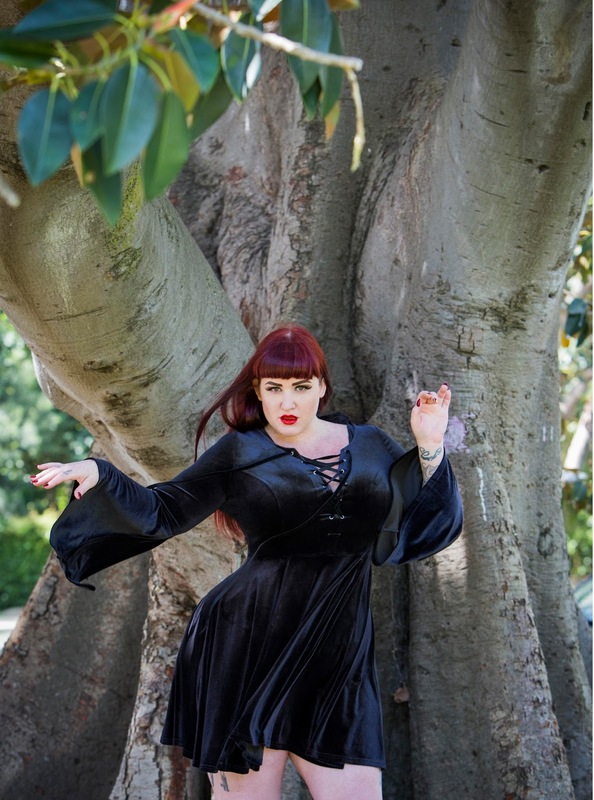 Just like the Griselda I'm wearing this After Death mini in a 2XL and it fits like a dream. My bust is a little larger than the seem but that's just my life these days. The print however hides this a little and the faux buttons draw your attention up to a higher point. The print features skulls, moths and stags on a green background which is almost a dirty seafoam shade and it's absolutely stunning up close. This colour is very different from what I'm use to wearing but I actually love how it pairs with my red hair and it has inspired me to try more of these dirty greens and blues. Length wise this is a little shorter than the Willow but still good if you have killer pins and works amazing with tights in winter. If this style is a little too short for you though the Dark Sea Maxi is a purple and black version of this dress and I highly recommend it. Many thanks to Damien Bowerman for working with me on these images and many more. It's always a brilliant shoot when we get together.